If you are into tiny houses it's probably because you want less clutter, more free time, and a simpler, less demanding lifestyle. I wanted to be able to spend extra time, money, and resources on the things that matter the most to me. money on rent, mortgage, and/or utilities. 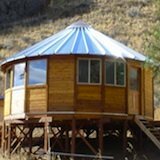 My goal with this web site is show you as many options in small and alternative dwellings from tiny to small, yurts to studio apartments, and cottages to micro cabins while educating you on the possibilities within each. The idea is to inspire you to ask yourself, "how much house do I really need so that I can be happy and enjoy the most freedom in my life?" Most of all it's about having fun and enjoying life right now. 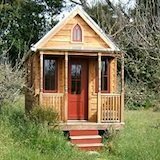 I love tiny homes because they give people freedom. 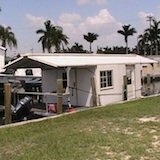 You'll also find all sorts of RVs, tiny houses on trailers, teardrop campers, cob, and shipping container houses. Just look at the menu on the left hand side and you'll always know where you are or where you want to go. You can subscribe to this web site with your favorite reader – and you'll be glad you did because I am always adding interesting things. For now get comfortable, grab a drink, and explore! If you want to receive weekly updates via e-mail from us just sign up below and I'll see you inside. This section covers the smallest of houses. From ones built on trailers to mini cabins on a foundation. Small spaces upwards of 500 to 1200 square feet depending on the number of inhabitants. Our new section on cob explores the possibilities this medium can provide you thanks to Pat Hennebery. This section focuses on how to simplify, declutter, and re-prioritize your life along side your dreams. If you want to replace your car but aren't completely ready for that long commute on pure muscle power. Or if you just want to have fun with a faster bicycle. From studios and one bedroom apartments to multi functional families in an apartment. 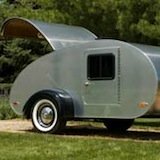 The smallest RVs on the road today that you can pull with the car you already own. Van based motorhomes from the VW bus to the larger Dodge Sprinter class B motorhome.